Officials of the Department of Game and Wildlife have called for a thorough cleaning of the environment to ward off reptiles, following preliminary investigations and assessment they conducted in Essienimpong and Kwaaso in the Ejisu municipality which have been invaded by snakes. The team, who visited the two communities and interacted with the people, believe that the recent long drought coupled with the destruction of the natural habitat through bushfires might have forced the reptiles to invade these towns, since their habitat had been destroyed. The Regional Manager of the Wildlife Division for Brong Ahafo and Ashanti, Mr Charles Haizel, said preliminary assessment by his men indicated that the snakes moved to the communities and laid their eggs as a result of a bushfire in a forest in the area. He said samples of the snakes had been taken for further studies and identification, adding that it could also be that the recent heavy rains might have washed them from where they were hatched to the communities. The two communities were gripped with fear and panic after the invasion of their homes and shops by hundreds of the snakes. Since last Monday, the residents have been living in great trepidation, especially when the snakes, three different types, emerged from holes in homes and street sides, usually after 7p.m. each day. 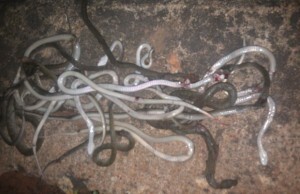 As many as 87 snakes were killed one night in a single house. It became worse last Wednesday night when the lights went off. Most of the members of the community, especially the youth, went out on a snake-killing spree.